This Easter, we want our kids to have a major fun experience, different from everything they have ever attended. 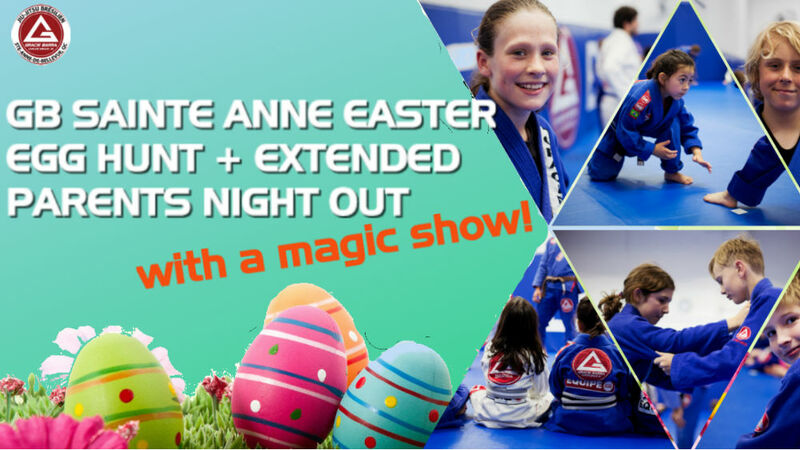 That’s why we are preparing a unique event, that will take place on April 26th (Friday after Easter): the EXTENDED EASTER PARENTS NIGHT OUT. Besides our regular play & learn time, the kids will take part in a super fun egg hunting. The games will be followed by an amazing magic show. That’s right: AN ENGAGING, INTERACTIVE AND MYSTIFYING MAGIC SHOW WITH THE AMAZING TODSKY!!! All of this at a little extra cost. Please check the details below and REGISTER ASAP by contacting our staff (info@gbsainteanne.ca), as the spots are limited. Kids are welcome to bring one non-member guest of their choice for this event. Includes Easter egg hunt and then magician show starting at 7pm. NOTE: If your guest sign-up, you both get a free month! Professor Marcelo will be there. We hope you will be too! Previous Post Celebrate your next BIRTHDAY with us! A Summer Camp your kid will never forget! Parents Night Out exclusive and free for members! The benefits of Gracie Barra BJJ are far-reaching and will touch every aspect of your life. At GB, our students become leaders. The practice of martial arts nurtures your independent thinking, supports your fighting spirit, and helps you achieve your personal BJJ goals.